Jailed British-Iranian woman Nazanin Zaghari-Ratcliffe will be given diplomatic protection by Britain, Foreign Secretary Jeremy Hunt has said. It means the case will now be treated as a formal, legal dispute between the two states involved - Britain and Iran. Mrs Zaghari-Ratcliffe was jailed for five years in Iran in 2016 after being convicted of spying, which she denies. Mr Hunt said the move was unlikely to be a "magic wand" to get her released, but was an "important diplomatic step". He said it "demonstrates to the whole world that Nazanin is innocent" and signalled to Iran "that its behaviour is totally wrong". The Iranian ambassador to London said the decision "contravenes international law". 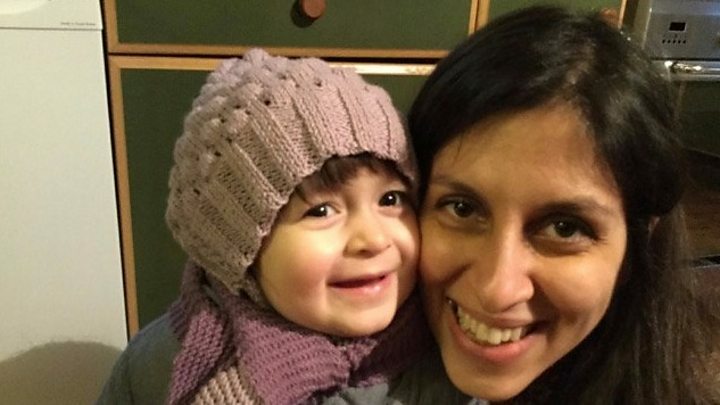 Iran refuses to recognise dual nationals so does not recognise Mrs Zaghari-Ratcliffe's right to be represented by Britain. Diplomatic protection is a rare legal procedure in international law. States can use it to help one of their nationals whose rights have been breached in another country. It is very different to diplomatic immunity, which is something given to diplomats to ensure their safe passage and protection from prosecution. According to the BBC's diplomatic correspondent James Landale, her new legal status will not force Iran to change the way it treats her. But it will allow Britain to raise her case with greater ease at international forums such as the United Nations. Mr Hunt told BBC Radio 4's Today programme the decision to grant Mrs Zaghari-Ratcliffe diplomatic protection "sends a very strong message" to Iran. Addressing the republic, he said: "You may have disagreements with the UK, but at the heart of this is an innocent woman, vulnerable, unwell and scared. She should not be paying the price for whatever disagreements you have with the UK." Asked if he was prepared to take Iran to international court, sanction it, or summon its ambassador, Mr Hunt said "all these things are possible, but we would like to solve this in an amicable way". He added that diplomatic protection had not been granted to a British citizen in 100 years. "It's difficult to know exactly what the impact will be. But we do want the world to know the UK will not stand by while its citizens are unjustly treated." Asked about Iran's allegation that the UK had broken international law, Mr Hunt said he "would expect some sort of negative reaction" from the country. Now this has been elevated to a formal state-to-state dispute, Britain can look for allies on the international stage to put collective pressure on Tehran. So what British diplomats hope is that this sends a clear signal to Iran that this issue is not going away, that the UK government is determined to keep pushing for Mrs Zaghari-Ratcliffe's release, and that it is prepared to escalate the dispute in the face of Tehran's intransigence. The granting of diplomatic protection will have no immediate impact on Mrs Zaghari-Ratcliffe's conditions in jail in Tehran. But what diplomats hope is that it will focus minds in Tehran, not just in the foreign ministry but also among the hardliners whom officials believe will ultimately decide Mrs Zaghari-Ratcliffe's future. The question now will be how Iran responds. Read more: What will diplomatic protection mean for Nazanin? 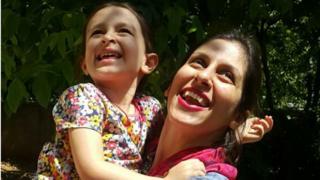 Media captionNazanin Zaghari-Ratcliffe's husband Richard said the news she will be given diplomatic protection "changes the stakes"
Richard Ratcliffe, who has been campaigning for his wife's release - and for the UK government to take this step - welcomed the news. He told the Today programme on Friday: "Until yesterday, it was our problem that the British government was sympathetic with, in solidarity with, trying to help us along the way. "Now it's also the British government's case and all the injustices that happen to Nazanin are effectively injustices to the British government." He said he hoped the decision would allow doctors to check on his wife's health, as she had been suffering "neurological problems". He last spoke to her on Wednesday, he said, and the prospect of being afforded diplomatic protection meant she was "a bit more upbeat". Mrs Zaghari-Ratcliffe, who went on hunger strike in January over a lack of medical care, had been "very low again" recently, he said. Human rights organisation Redress, which has been pushing for the UK government to grant diplomatic protection to Mrs Zaghari-Ratcliffe for more than a year, said Mr Hunt's move was "hugely significant" for her and would give her hope for the future. And Liberal Democrat spokeswoman for foreign affairs, Jo Swinson, described Mr Hunt's decision as "a promising and welcome step in the right direction". Mrs Zaghari-Ratcliffe, 41, was a project manager for the Thomson Reuters Foundation and lived in London when she was arrested in Iran in April 2016. She was later sentenced to five years in prison for allegedly plotting against the Iranian government. She maintains her innocence, and says she was on holiday in Iran taking her daughter Gabriella to visit her parents. 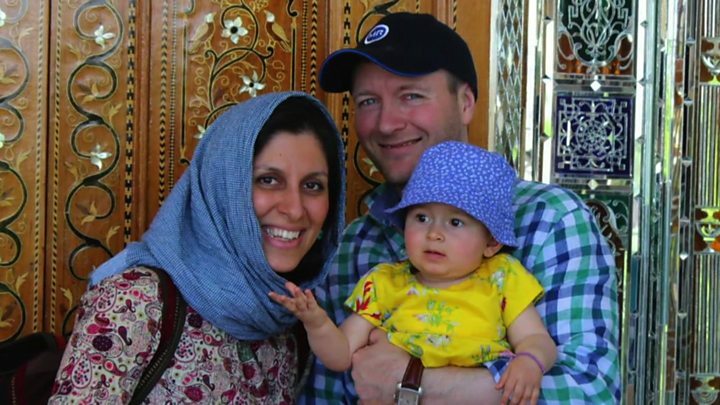 Nazanin Zaghari-Ratcliffe: What will diplomatic protection mean for her?